Who Will Benefit From Artificial Grass? Okay, so we understand that we’re well into December and the thought of doing up your garden might be the furthest thing from your mind- despite the fact that the “off-season” is the best time of year for you to make a purchase. But the benefits that come along with an artificial lawn are applicable all year-round, and that’s why you should certainly start thinking about having some artificial grass installed over the winter period. Artificial grass will provide a positive experience for every member of the family, meaning that you can get busy preparing yourself for a very merry Christmas. But you don’t just need to take our word for it, because we’re here at Great Grass to run you through who exactly will reap the benefits of a brand new artificial lawn. There’s nothing worse than letting the dog out into the back garden on a Saturday afternoon, and then find him treading mud all over the house. The installation of an artificial lawn will ensure that you no longer have to worry about such a nightmare scenario, as no mud will be involved! On top of this, there’s no need for weed killer on artificial grass, which will eradicate any risk of poisoning your pets. Our artificial grass looks and feels so much like the real thing that we’re sure that they’ll never know the difference! A huge benefit of artificial grass is the fact that it looks great all year-round and is incredibly durable. This means that, regardless of whether there’s just been a torrential downpour, your children will be able to get outside and enjoy the garden on a more frequent basis! As there’s no mud involved, artificial grass also provides a lawn surface that reduces the risk of any children slipping and hurting themselves, which will ultimately mean you no longer have to worry about grass burns. Because it’s such a clean, fresh surface, your children are bound to love the artificial lawn! You’re the one paying for the new lawn, right? Well then it stands to reason that you should benefit too, and it just so happens that you might benefit the most. With such low maintenance required, you’ll find that you’ll have much more time to yourself and you’ll no longer have to worry about wrestling the lawnmower out of the garden shed. Additionally, artificial grass keeps its vibrant colour all year, meaning that you’ll have an enjoyable place to relax for 12 months of the year. 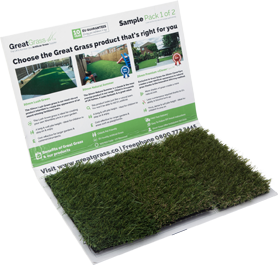 Here at Great Grass, we provide a range of excellent artificial grass products that could benefit the whole family! If you want any further information on the lawns that we have available, then please get in touch with our dedicated team!